Save The Clone Wars: #SaveTheCloneWars and Bonus Content Revealed? #SaveTheCloneWars and Bonus Content Revealed? Earlier today, thanks to Star Wars Underworld many Clone Wars fans were engaged in what was referred to as a #SaveTheCloneWars twitter protest. 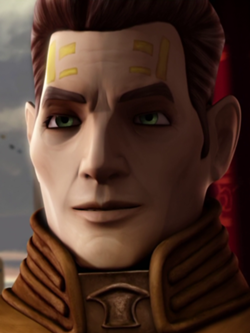 I saw hundreds of tweets asking @Disney to #SaveTheCloneWars, and I tweeted and retweeted more than I can count. We hope that this event will get the attention of Disney and let them see how passionate Clone Wars fans are. We have to assume that the Rush Clovis arc that was pushed back from season five will be one of the two arcs, and from the video Dave posted, the other arc may be a clone-centric one. TheForce.Net's article also included a mention that some at LucasFilm Animation felt that the fan response was "tepid." Many fans were probably lulled into a false sense of security by PR speak of the press release and Dave's video. Thanks to Jimmy Mac for sounding the alarm earlier than anyone else I follow. 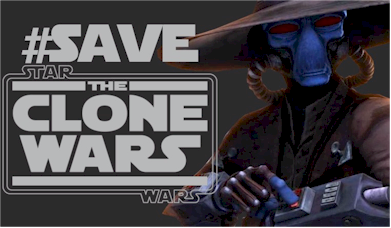 Were it not for he and Jason on Rebel Force Radio, I wouldn't have been as vocal in our campaign to #SaveTheCloneWars or in my support of the cast and crew of Clone Wars. the sequel trilogy; however, we love The Clone Wars! We want more than bonus content! We want the many stories that the creators have set out to tell to be completed. We ask that the powers that be to please reconsider this decision. Tepid? That's because few people believed what was happening until it was too late. that's too bad, Aurra Sing was in the gameboy advanced game "the new clone army"
Does anyone else think it would be a good idea to try and get the 501st legion to march on Disney Studios? I saw the idea on Twitter and think it's a pretty good one. I agree fan response has been tepid. However, Dave Filoni's broadcast to the world made it sound like we'd be getting at the very least a full season 6; it was just that they wouldn't appear on Cartoon Network, and maybe wouldn't appear on TV at all. When you put out a statement that is at best ambiguous and at worst still promises many more episodes, the fans are going to respond with patience and be lulled into a false sense of security about the future of the show. Try being a bit clearer next time!